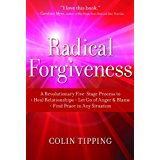 Radical Forgiveness by Colin Tipping is the cornerstone for this work which I love to call Radical Well Being. When I first read the book in 2006 I knew it was the key for me to get to the other side of blaming anyone else for what was going on in my life. I usually tell a potential client to Google “Jill’s Story” and read the abridged version of the first chapter of Radical Forgiveness. The situation doesn’t have to be similar to yours, but if the idea resonates, then this work could be the ticket for you!